Home › Medianism Home › MELI FAQ › M8 Does GDP have any advantages over MELI? MELI won’t ever completely replace GDP because GDP will always be a better measure for certain purposes. For example, it will always be a longer historical data series than MELI for examining the past. GDP will also always be better for the purpose that it was originally invented for. GDP was first measured during the Great Depression when Roosevelt wanted better information about whether overall economic production was increasing or decreasing and to see differences in economic growth in different sectors of the economy. GDP and MELI have different advantages for analyzing recessions, but GDP is better for examining particular sectors of production like housing, oil, or exports. Soon thereafter, GDP became useful for ascertaining how much production the US could muster for fighting World War II. GDP is clearly the better measure for analyzing the capacity for war production. Examining the components of GDP will always be useful for this kind of sectoral analysis, but per capita GDP is a completely different animal. Per capita GDP is almost always used as a welfare measure and it should be eliminated because MELI is always better for measuring welfare. GDP data is more comprehensive for historical analysis because we didn’t start collecting median income data until later. GDP data is better for analyzing the production levels of particular industrial sectors like farming or war material. GDP is useful for macroeconomic analysis of recessions and growth that require sectoral analysis. GDP is useful for macroeconomics, but median income should also be at least as important as GDP. For example, a recession is defined as a time when there is a drop in total income (meaning GDP drops). These periods are marked on the graph below with shaded grey bars, but these official recessions are not what the most Americans experienced. This graph shows that the majority of Americans really went into a recession sometime in 2008 and stayed in a recession for over twice as long as the official dates show. This is because median income started declining at the beginning of 2008 and kept dropping for more than twice as long as GDP dropped. 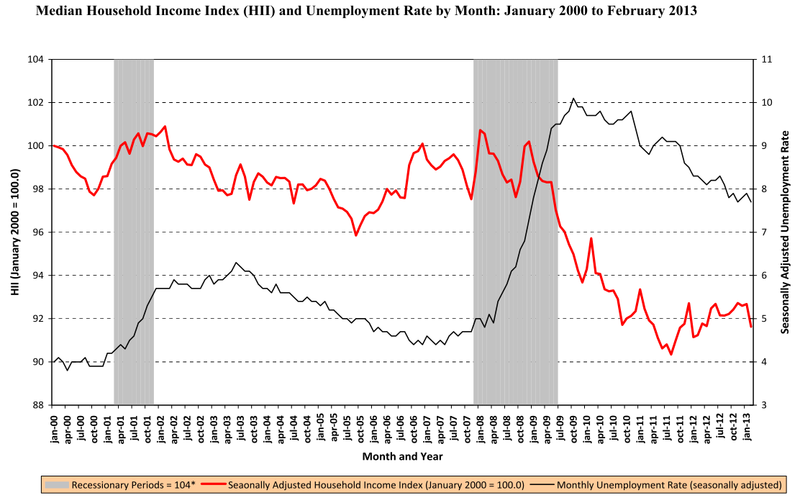 It is hard to pinpoint exactly when median income started declining because the median income data is noisy and poorly measured. It is much noisier than GDP data because the government spends many times more resources measuring GDP. Even when the median income stopped dropping at the end of 2011, it stayed stagnant for the next two years without any significant recovery. The Fed governors don’t know about median income because they all earn far above the median income and probably most of their friends earn well above the median income too, so GDP is probably a more intuitive measure of welfare than median income for them. When GDP (total income) was rising in 2009 and 2010 and median income was declining, it was because of an increase in inequality. Incomes were rising enough for a small number of elite Americans (like Fed governors) that total American income, GDP, was rising even though the majority of Americans were experiencing falling real incomes. MELI would be a better guide for overall macroeconomic policy (at the Fed and elsewhere) than GDP even though some parts of GDP (sectoral analysis in particular) will always be useful for understanding how to help MELI recover.